Boston has a new bicycle sharing program, implemented on July 28th, and it is off to a great start. The program, which is known as Hubway, stations bicycles throughout the city at terminals. You can rent a bike for a short period of time, or become a member and have a year of privileges. Hubway is another step in making Boston a bicycle-friendly city. 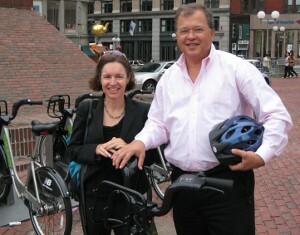 The city, under the inspiration of Mayor Menino and with the guidance of Olympic cyclist and Bicycle Program Director Nicole Freedman (shown at right with David White, at the Government Center Hubway Station), has expanded its bicycle lanes and its bicycle parking, and it now has added convenient bicycle rentals. Hubway deploys 600 bicycles at around fifty stations around the city. A bike can be picked up at one station and parked at another, making the program convenient for commuters, students, and tourists. There is even an phone application called Spotcyle which gives up-to-the-minute data on which terminals have bikes or available parking docks. David White, one of the attorneys at Breakstone, White & Gluck, called these efforts “great steps to making Boston a safer place to ride your bicycle.” The program will also reduce pollution and promote fitness. Hubway also promotes safe cycling by urging cyclists to always wear a bicycle helmet, and to always observe traffic laws, which apply equally to bicyclists. White urges Boston cyclists to observe Massachusetts bicycle laws (read more here). He also urges cyclists to check their automobile insurance policies to make sure they have adequate uninsured and underinsured motorist coverage, which provides protection if there is a bicycle accident (read more here). Congratulations to the City of Boston and Hubway!